Laurier students promoted healthy lifestyles and raised awareness about suicide prevention during the annual Residence Rumble charity basketball game on March 22 at Wilfrid Laurier University’s Waterloo campus. 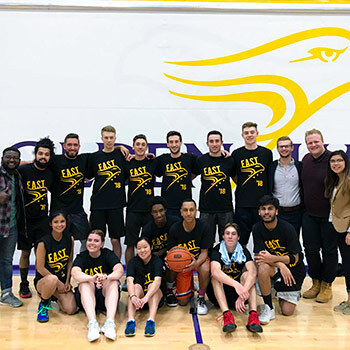 Organized by Laurier’s Residence Athletic Council, the fundraiser pitted a team of first-year students and residence dons from the east side of Laurier’s Waterloo campus against a team from the west end of campus. A residence-based club, the Residence Athletic Council organizes events like Residence Rumble to encourage first-year students to live healthy lifestyles and to give back to the broader community. The charity basketball game raised more than $700 for the Canadian Association for Suicide Prevention. Adam Rooke, experiential learning coordinator in Laurier's Department of Residence, said the fundraising event exemplifies the impact students can make. “The Residence Athletic Council students, like the many involved with our first-year leadership programs, have worked tirelessly this year to provide opportunities for others to engage on campus while giving back to the broader community,” says Rooke. Shah says the Residence Rumble charity basketball game is about more than basketball and friendly competition; it’s the culmination of the council’s year of hard work to create a fun and stress-free atmosphere for first-year students. The event included a half-time skills competition, music, door prizes and raffles. Team East won the game 72-66. “I think we ran a really successful event, as seen by the proceeds we collected for the Canadian Association for Suicide Prevention and the feedback from students at the game,” says Shah.